With regard to milk, we regularly encounter very contrasting opinions, ranging from ‘as much as possible’ to the vegan complete rejection of all dairy products. 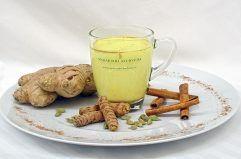 So what is Ayurveda’s viewpoint? 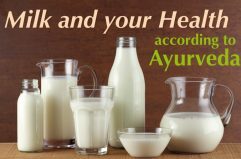 Ayurveda clearly states that milk – in the right quality and quantity – is very good for our health. The ideal milk in the Ayurvedic sense is provided by your own cow, which has a large outdoor area to roam in, eats only natural, good-quality food, and enjoys loving care. Her horns are not removed, nor is her calf taken away. Drinking milk in the Ayurvedic sense is drinking the still-warm milk from this one cow. Such milk is described as nourishing, easily digestible, and sattvic.